ColorMan is a plugin / XTension for InDesign and QuarkXPress which provides both a more rational production and an easier way to improve the quality of printed images. When an image is dragged onto an image frame on a page it adjusts to the predefined size of the image frame in the page layout. Alternatively you can drag the image onto the page and it is pasted in the size defined in the metadata on the image. Caption added in metadata comes on the page in a text frame with the correct typography. Byline can be picked up from the metadata too. After the document has been finalized with the correct cropping and scaling of the images, press “Process” and a copy of the image is converted to CMYK or grayscale, given the right file size and electronically sharpened. 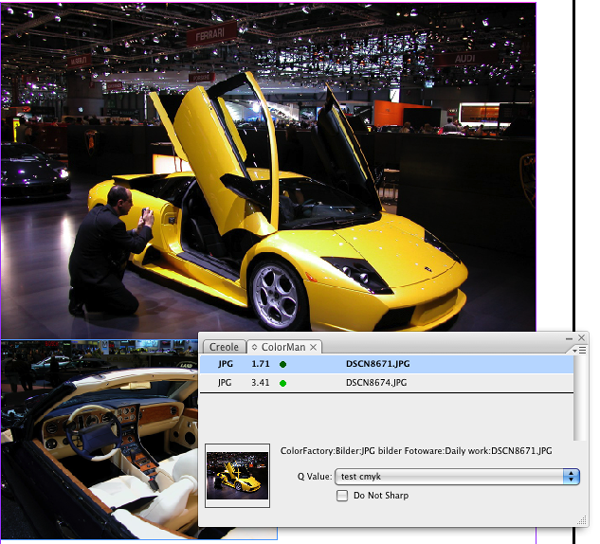 The original image file stays as a RGB/JPEG in the archive or desk-folder. When news stories are toned up or down as the news headlines change shortly before deadline , it can be time consuming to redo cropping, scaling and sharpening of images. Often you are left with scaling in the layout software, with poor quality as result. With ColorMan you can perform all these processes within seconds directly before the page is sent and without damaging the quality.